Register now for a SPRING SING on Saturday September 12. Singers of all ages and levels of musical experience are welcome to join a day of music, laughter and learning. Choirs are encouraged to register early and pay as a group prior to the day. 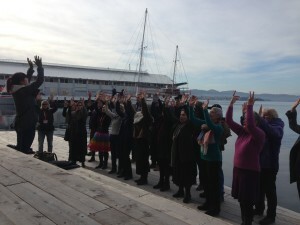 We sang in the streets, we sang at ArtMob gallery, we sang in a dungeon (Battery Point) for a ghost tour, we sang on a bus, we even sang-in the local seal with â€˜Come sweet deathâ€™ at the Harbour (pictured)! Choirbolical had a wonderful time singing and being entertained by choirs large and small and a great guide Margaret during our pop-up performances. 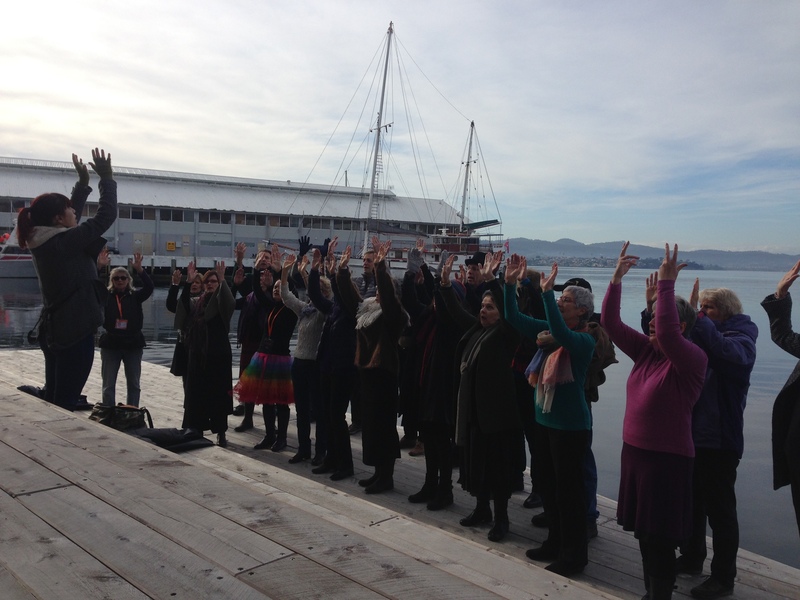 Thank you Festival of Voices HOBART. We hope to see you again. – July 1 and 15 could be used for parts practice at De Molay or at people’s homes. Historically Choirbolical has operated on the school term basis.Â Kent raised for discussion the possibility of meeting during school holidays if these occurred over our usual rehearsal times of the first and third Tuesdays of the month.Â Astrid is open to the possibility.Â Some of the issues to consider would be the increase in fees necessary to cover what would be 2 or 3 extra rehearsals in the year.Â Further discussion to follow. Glennie Concert Hall has been booked as a venue.Â Â Need a large venue because over 100 choristers confirmed to attend. Publicity â€“ work up flyer from last year. Action:Â Kent to send flyer to participating choirs, requesting that they give information about vegetarian/gluten free attendees for catering puposes. Allocated $750 for sandwiches/wraps for 150 participants. Languages & Cultures Festival â€“ suggestion that Choirbolical could be one of the â€œrovingâ€ choirs.Â Â Date is Sunday 10 August â€“ Astrid is available. Astridâ€™s 3-session absence in July:Â we will self-manage the rehearsals â€“ practice in parts (each part to bring recording of their songs to practice with) and then spend some of the night coming together with all parts, etc. Meal allowance for Astrid. Â Agreed to cover this.